I love Thanksgiving. But really, how could anyone not love Thanksgiving? 4-day weekend, non-religious and non-political holiday, family, friends, food and, of course, wine. Did I mention family? Anything cuter than 21 month old Zinnia helping her Bubie put the final glaze on the turkey? Zinnia helping her Bubie with the final glaze on the Thanksgiving turkey. This year I went into the cellar and the Merlots jumped out at me. Merlots rarely jump out at me for any dinner, and I don’t have a huge selection, but there they were, begging for their opportunity to join the holiday party. OK, why not give it a try? Merlots can be very nice wines, with great flavor and balance and great with a meal. And not quite as big a wine as Cab, usually. I added to the Merlots a bottle of sparkling wine to start, plus some whites, and then some dessert wines. 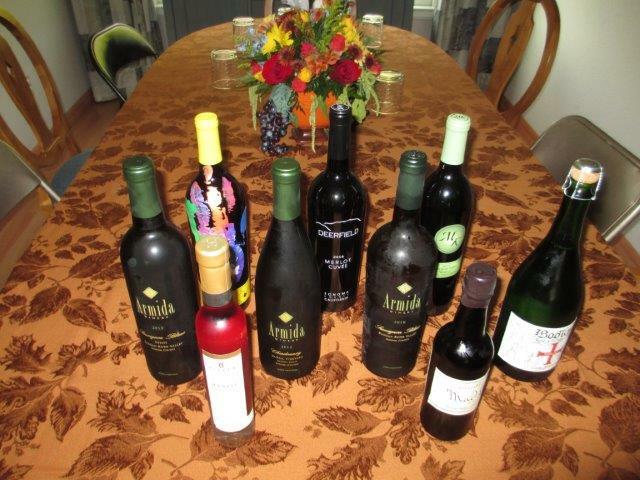 Thanksgiving wine lineup included sparkling, whites, Merlots and dessert wines. Yes, we did decant all three Merlots. Nice decanters on the table to go with the beautiful dinner, plus it helped the wine. My personal favorite was the 2004 Meeker Merlot, but everyone had their own favorite. 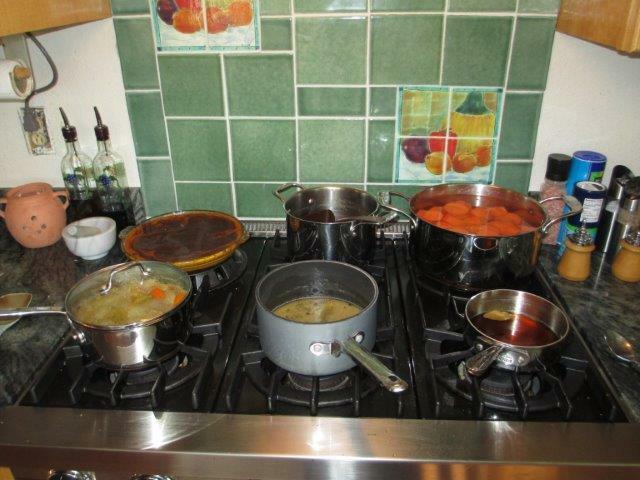 Clockwise from upper left: pumpkin-chocolate brownie cooling on the stove, maple syrup glaze, sweet potatoes, another sauce, two different components of the gravy. Thanksgiving dinner had everything (the full 6-burners on the stove were in use, as were both ovens), and we’re still recovering from all that we ate. We hope you had a great Thanksgiving dinner too! This entry was posted in wine-food pairing and tagged Armida Winery, Bodkin, Deerfield Ranch Winery, Eagle Ridge Vineyard, Meeker Vineyard, Merlot, MerlotMe, Mitchell Katz Winery, Peller Estates, Thanksgiving on November 29, 2014 by vvblogman.